In my opinion this was not a very kid friendly recipe. Most of it was cutting with a knife and my girls are not allowed to use a knife, so I did all the carving and gutting the navel. 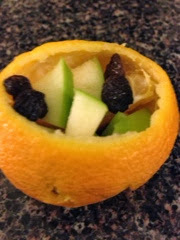 Then I let the girls fill it up with fruit and raisins. They added a pipe cleaner for the stem (we didn’t have green spoons lying around in a drawer). The girls enjoyed filling it up and eating all the fruit. I would try it next time with a big orange. 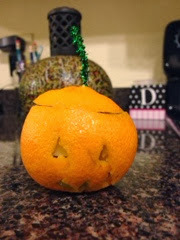 It would not cave in as easy when carving it and it would hold more fruit for a bigger snack! I guess being married to a Texan has rubbed off on me, bigger is better! We will try it again closer to Halloween! Let me know how yours turns out.